Independent fragrance brand Gallivant recently launched Tokyo, a "zingy, spicy, woody fragrance" that's a tribute to kōdō, the Japanese "way of incense." Tokyo's notes include yuzu, bergamot, black pepper, cardamom and wasabi; hinoki, cedarwood, incense, iris, rose and nutmeg; and amber, sandalwood, vetiver and patchouli. It was developed for Gallivant by perfumer Nicholas Bonneville. I've had luck trying Gallivant's fragrances in the past, with Brooklyn and Amsterdam becoming my personal favorites from the line. Even when something from Gallivant doesn't match my personal taste, I can appreciate its smart sensibility. Tokyo fits the Gallivant house style: it's gender-neutral, appropriate for a variety of occasions, and accented with an intriguing blend of spices. Tokyo begins with some citrus and pepper before it heads into the incense zone, and its incense core is still sharp and aromatic, even a little green, rather than smoky or vanillic. This phase reminds me of elemi (although that's not officially listed as one of the notes) and I can also recognize the hinoki, which was a note I first encountered in Six Scents #087. This pleasantly nose-tingling combination persists for a while. Tokyo's dry down slowly turns woodier with its notes of cedar and sandalwood, but never quite loses its piquant edge or its traces of pepper and cardamom. When I was wearing Tokyo, I often thought I was smelling something or someone near me, rather than my own skin — this scent seemed to diffuse in an interesting way. It had above-average longevity on me and developed smoothly. 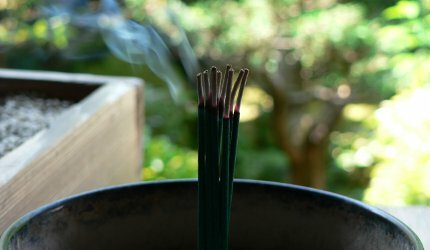 I don't wear many incense-y fragrances, and I'm hoping to share the rest of my Tokyo sample with incense-expert Kevin in order to get his reaction — but I enjoyed trying this one on a few days of transitional summer-to-fall weather, when many of my usual fragrances didn't feel quite right. If contemporary incense perfumes are your particular thing, you may want to explore Tokyo. 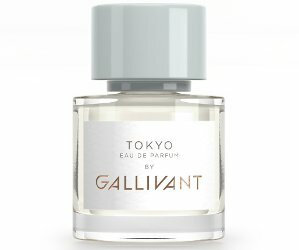 Gallivant Tokyo is available at Indigo Perfumery, Luckyscent or Twisted Lily, $95 for 30 ml Eau de Parfum. In the UK, try Roullier White. Note: top image is incense at Ryōan-ji [cropped] by Katie at flickr; some rights reserved. I thought this one was alright but it smells awfully familiar (I can’t quite put my finger on it). I would love to smell real Hinoki one day. I wished I could smell the wasabi. It reminded me of something, too…not sure what! Very glad to read this review, Gallivant is on my sampling wish list, Tokyo bumps it up a bit. I hoped to love CdG Kyoto but it turns into little tree car freshener on me! Yikes. I have a fondness for all things Japan, so Tokyo may be the Nippon inspired incense I long for. Little tree car fresheners are a nostalgic smell for me, but definitely NOT something I would want to smell like/of! ???? I got a manufacturer’s sample of this from LuckyScent. I now look forward to trying it based on your comments! Thanks for the review. They’re intelligent fragrances, but not overly complicated or weird-for-the-sake-of-being-weird! J: This IS on my to-sample list…as is a hinoki tree I plan on buying at a nursery (maybe this weekend). Do you know a good hinoki centered perfume, Kevin? I love Le labo’s hinoki shower gel and can’t find a perfume anything like it in perfume. Amy: I love Comme des Garcons Monocle/Scent One: Hinoki. Heavenly. In fact, I like every scent in that series. Thanks so much Kevin! As it turns out I have samples of all three coming any day now! Jessica, this review and your others of Gallivant fragrances just caused me to order the discovery set from Luckyscent – they all sound really interesting and promising. This is on my list to try – I am currently in love with Gallivant’s London, and I have enjoyed a few others from this house, too.